When I first moved to Los Angeles, I was in Westwood without a car and without access to any of the great Chinese food I had been hearing about. I have fond memories mooching rides all the wayÂ to Monterey Park for the sole purposes of late night, greasyÂ Chinese cafe food and pre-Boba Explosion Era boba milk tea. There was so much as one or twoÂ Lollicups in the area. The ritual of a Saturday or Sunday morning at NBC Seafood was to get there before 11:30 to minimize the wait for a table. But the tastes that resulted were always worth the labor for us Westside college students – especially this Midwestern one. Enter: 2008, 2009 and now, 2010 – where specialized food trucks join the movement that Kogi BBQ singlehandedly initiated. Well, it’s now come to dim sum – and though some may feel the truck movement has gotten “a lot” out of hand at over 75 food trucks (and counting), I myself can’t complain. If it’s a choice betweenÂ Subway sandwiches or Trimana sandwiches every Monday through Friday at my 9 to 5, who am I to argue with entrepreneurs who choose to expand those choices – and so widely -Â for me? I admit, I had reservations about a truck that would hold a monopoly on an entire sub-genre of Chinese cuisine on the Westside. 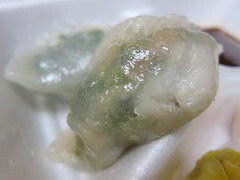 Sorry -Â I would sooner die than eat dim sum I didn’t drive at least 15 miles for, and being wrong about that generalization was worth the risk of cold shu mai or stale-skinned har gow. So when I got invited to check out the Dim Sum Truck on a preview during one of their soft openings, Alex – the U$C grad who put the pedal to the metal when everyone else (including myself) only talked about how there should be a dim sum truck – was gracious enough to give me a sampling of everything from their soft opening menu. Apparently, there will be more menu items on the cart in the truck once it officially rolls out tomorrow night at The Brig on Abbot Kinney – but half the food that I got was enough to put me in a truly authentic post-dim sum food coma…without the 15 mile drive west. I am a big fan of turnip cakes. 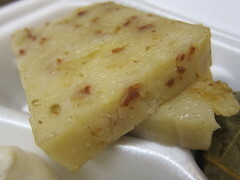 My mom makes turnip cakes and the Dim Sum Truck’s turnip cakes are pretty much as good as my mom’s. The sticky rice was also one of my favorites, with perfect flavoring, stickyness and a good amount of pork, peanuts, mushroomsÂ and even a shrimp thrown into the mix. To make things simple, Alex has concocted a mildly spicy, medium sweet and certainly soy sauce-based, well, sauce to dip all your treats in. It works, and though I asked “Where’s the mustard?” I was informed that it would be available upon official launch. Nice. The difficultyÂ (or ease, you pick) with a food truck that serves dim sum is perhaps that its food can’t carry all the authenticity by virtue of not being surrounded by its traditional environment. 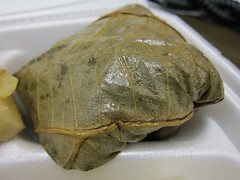 Har gow and shu mais typically come served in their piping out, steaming metal tins when you sit down to eat in a restaurant, but when I had finally driven back to work and got to my desk with my styrofoam containers – I had somewhat wished my dumplings, including the gow choy (shrimp & chive dumplings), were hotter. But there was a decent amount of filling in each and they were solid for the most part. The chicken & mushroom buns, however, could have been a bit more fresh overall and were wet on the bottom. The pork bun (golden and glazed) was solid on the bun but like the chicken & mushroom buns, could have used a little more filling. But ah, dessert – all of which were devoured before I could remember to snap shots. The sesame balls with sweet lotus paste were perfectly crispy on the outside and moist on the inside. The egg tart crusts were multi-layered and awesomely flaky. Win. 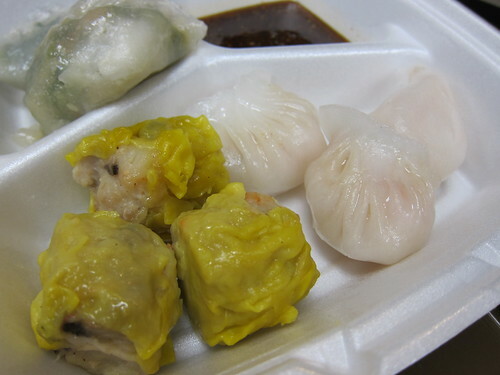 Now, if you’re a Westsider with a dim sum fix to remedy, you can chase down the truck at lunchtime or otherwise. It’s a solid solution, for the most part – just don’t be expecting chicken feet. Yet. 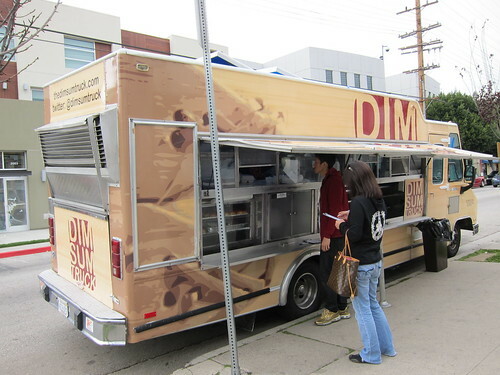 This entry was posted in Food, L.A., West L.A. and tagged Alexander Chu, dim sum, Dim Sum Truck, food truck, L.A., los angeles. Bookmark the permalink.